Last week, when we shared our Raspberry Sticky Buns, I admitted that up until a few years ago that I was terrified of working with homemade dough myself. 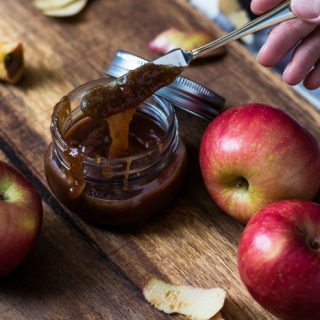 Around the time that our first was born and we started trying to eliminate as much packaged and processed food as we could. 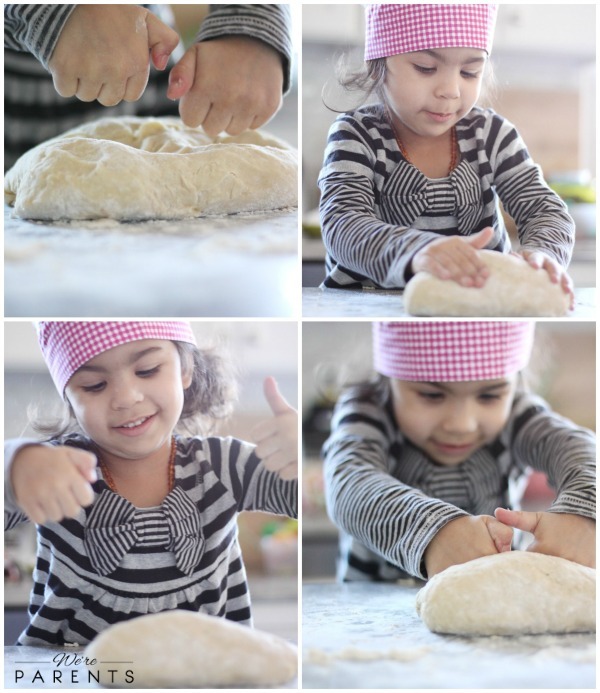 We used dough for so many things! Pizzas, pepperoni rolls, cinnamon buns, etc. I was determined to learn how to make it myself and get over my fear. Luckily, it came pretty easy to me and I’ve been loving it ever since. I make our homemade pizza dough three to four times a month and we all devour it. Before we got into the kitchen this week, I surprised our Mini Chef Skibbles with this adorable chef’s hat and deluxe baking set that Handstand Kids sent over to us. She was so excited for both things and we really love the size and pieces that we received from them. 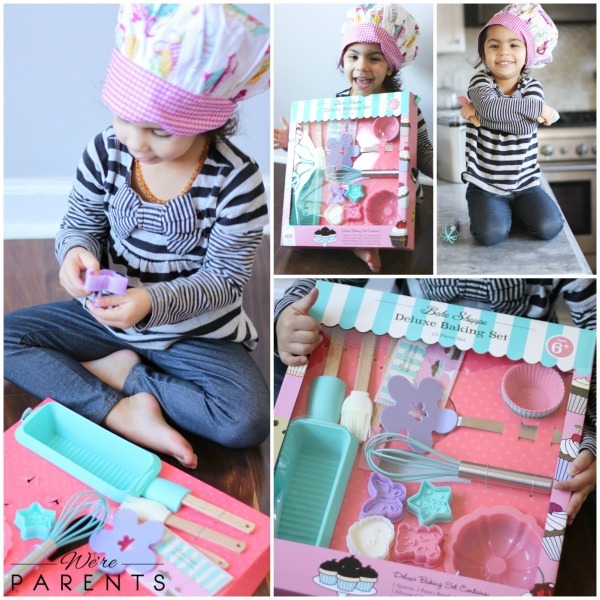 They fit perfectly in her hands and we can’t wait to use more of the pieces to make mini loaves of bread and cupcakes and more with our set. 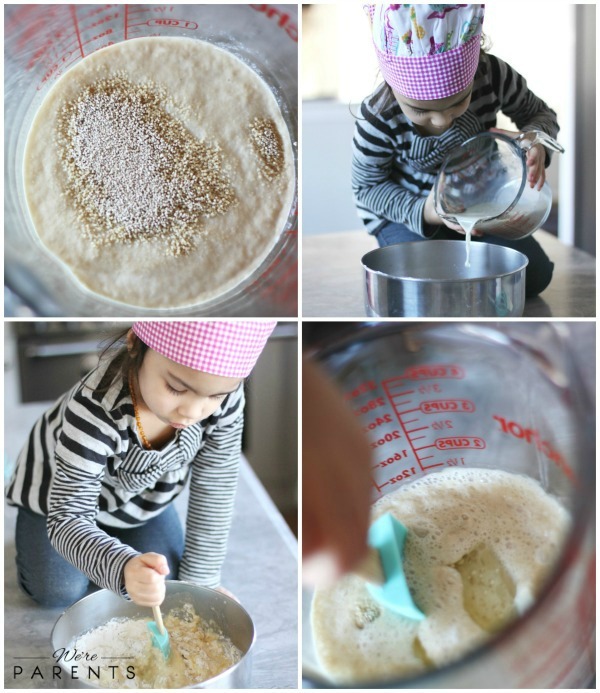 One of the reasons that I love getting into the kitchen with our Mini Chef is because I want her to have the foundation for the basics and beyond for getting around in the kitchen. I think it’s such a vital part of growing up and I wish I learned more before having to force myself to do so. I, personally, have so long to go and I’m still learning the basics myself. I love that my girls and I can learn together and I just pray that they gain from it throughout their lives. This week we got back into the kitchen with dough to make this homemade bread bowl recipe. I recently made bread bowls and my friends were asking for the recipe, so we made them a few times before perfecting the recipe. These are actually insanely easy to make and I couldn’t believe that we didn’t make these regularly before. 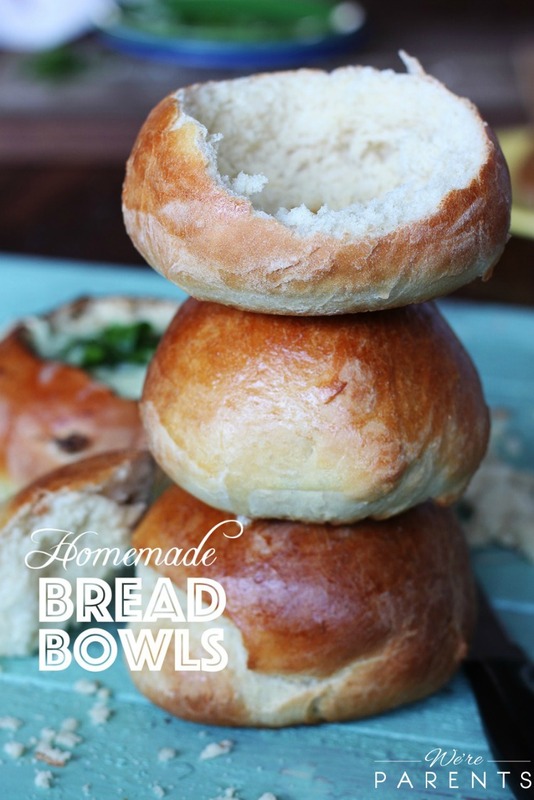 Skibbles and I like these as homemade rolls or home bread bowls. They are great for dips or soup and so much more. In a glass bowl, mix the sugar and water together. Sprinkle the yeast across the top of the water mixture. Let stand for 10 minutes until yeast is foamy. In the glass bowl, gently stir in the oil, milk and salt. In a separate large bowl, measure our 3 1/2 cups of flour. Pour yeast mixture into the bowl. In glass bowl, lightly beat the two eggs and add them to the mixture. Using a wooden spoon, gently stir until a dough forms. On a lightly floured surface, place dough on top. Use the remaining 1/4 cup of flour and a little bit at a time add flour until dough no longer sticks to your hands. Knead until smooth. About 3-4 minutes. Don't overwork the dough. In a large bowl, coated with oil, place dough inside. Roll the ball in the bowl to make sure the entire ball has a light layer of oil on it. Cover with a towel and let rise in a draft-free, warm place for one hour (or until it doubles in size). Pull dough out of bowl and punch it down. Divide dough into 4 equal portions to make large bread bowls. 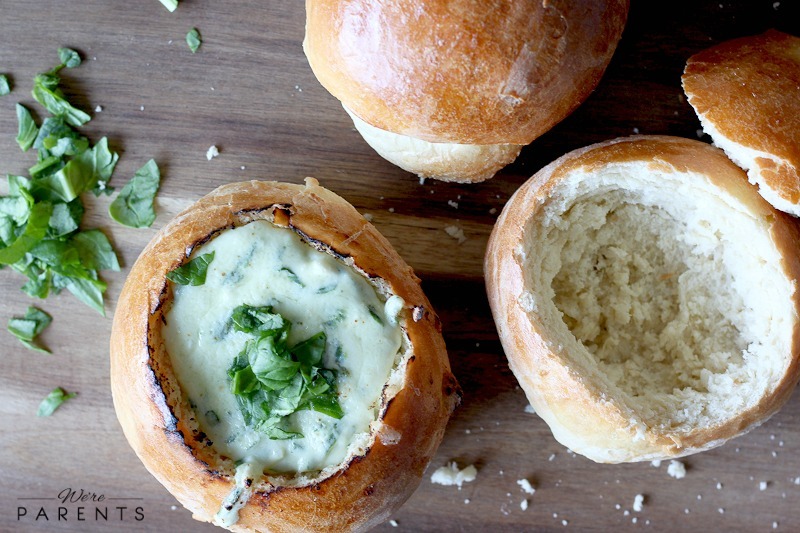 (if you want mini bread bowls you can divide dough into 10 equal portions. Take one ball and with the sides used to pull apart, pull down the sides towards the bottom of the ball creating a smooth top. Make sure that the all seams are at the bottom. Place ball on a baking sheet. Let rise, uncovered, for another 45 minutes. They will double in size again. Whisk together the egg white and water and brush onto the top of each piece. Bake for 18-22 minutes. Each bowl should be golden brown and cooked through. Cool for 5 minutes before attempting to cut tops off. Here’s the Cheesy Spinach Artichoke Dip Recipe that is in the bowl. You can head to HandstandKids.com to get your own Mini Chef apparel. You use Mini for 25% off your order at checkout! Yum! These look amazing! 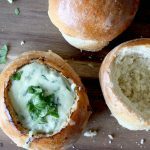 I’ve been making so much homemade soups lately and have been wanting to find a good bread bowl recipe. Thanks, can’t wait to try this! These look so good. Homemade bread is one of my favorite things to make. Can’t wait to try this recipe! AH! These look SO amazing! I can’t wait to whip them up!